On March 8, 1985, an explosion rocked the Bir al-‘Abd quarter of Beirut near the home of Ayatollah Mohammed Hussayn Fadlallah, the “spiritual guide” of Hezbollah. Though Fadlallah escaped unharmed, more than 80 persons were killed and 200 wounded. The assault was carried out by local operatives recruited by Lebanese intelligence, but it also took place in conjunction with an evolving American preemption counterterror program. 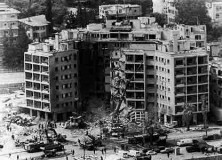 This initiative took shape within the National Security Council (NSC) and Central Intelligence Agency (CIA) after the U.S. embassy annex building in West Beirut was attacked September 20, 1984. An analysis of this assassination attempt and the organizational dynamics which underpinned it warrant review because similar dynamics could influence more contemporary counterterror practice choices. It remains unclear whether or not the choice of Fadlallah as a target and the specific plan to kill him originated in the White House or with local operatives in Lebanon, as accounts vary. Evidence does suggest, however, that there was no dispassionate American analysis of the role Fadlallah played in Hezbollah’s tactical decisions. In reaction to watershed terrorist assaults on U.S. interests, officials sought to craft an American firewall in Lebanon without proper consideration of the inherent nuances and intricacies associated with such a project. As a result, the approach was not guided by a carefully reasoned set of counterterror measures consistent with American foreign policy interests in Lebanon and other areas of the Middle East. Instead, the program revolved around ad hoc counterterror practices with an almost singular focus on hard-line actions to confront Islamic terrorist assaults. Importantly, there was no known, proactive effort to gauge Fadlallah’s day-to-day involvement with the operational side of Hezbollah. This omission likely led American officials to focus almost singular attention on Fadlallah rather than on chief tacticians such as Imad Mughniyah and Hussayn al-Musawi. An absence of consensus among high-level foreign policy officials about the preemption program, and possibly the plan to kill Fadlallah, contributed to the overall ineffectiveness of U.S. counterterror activities. There appears to have been unresolved conflict between groups of elite policy makers across the CIA, the Department of Defense, and the Department of State over the legality, necessity, and wisdom of the initiative. In some cases, disagreements about the utility of counterterror assassination existed within those organizations as well. Consequently, there was extremely poor interagency planning and coordination for the program. In particular, tactical oversight and management responsibilities—which ultimately failed to prevent local operatives from undertaking the assasination mission on their own—were not helped by broader bureaucratic strains and tensions over U.S. involvement with the Fadlallah attack. U.S. Lebanon policy—including the counterterror program—set unrealistic objectives given the realities of Lebanese politics. Interagency conflict played no small part in creating these mismatched goals. The corrosive effects of bureaucratic politics were aggravated by the ideological fervor of certain major players, making the prospect of consensus even more remote. A dysfunctional decision making system prevailed, where small groups of political advisors to President Ronald Reagan competed for presidential approval. There were also notable organizational inefficiencies associated with the U.S. National Intelligence Officer (NIO) structure. For example, a rigid set of guideposts instituted by the NSC essentially prevented the CIA from delving into the policy recommendation side of analysis. This resulted in unsatisfactory ties between nuanced analysis conducted by indidivduals with local knowledge and policy decisions. The extent of U.S. government involvement in the Fadlallah assasination attempt was and remains debated. Nevertheless, apparent U.S. complicity besmirched an already badly tarnished U.S. reputation and improved the standing of Hezbollah and other anti-Western elements throughout the Middle East. Moreover, the assassination attempt put into even sharper relief the distance between American pronouncements about democracy and fair play and the reality of the Reagan administration’s strong support for the heavy-handed Lebanese Maronite Christian government. The Fadlallah affair generally undermined the physical security of Americans and U.S. allies, and served as a contributing factor to additional terrorist assaults against U.S. interests. The Fadllah episode illustrates the inherent problems associated with preemptive counterterror practices and demonstrates how interagency conflict can reduce an initiative’s coherency, legitimacy, and effective implementation. It underscores the negative effects of policy disconnects and the structural deficiencies, misguided assumptions, and ideological fervor which help bring them about. As the United States tries to confront complicated terrorist structures similar to those found during the 1980s, it is crucial that lessons be learned from the U.S. counterterror strategies and activities related the Fadlallah affair.